Why choose our gaming headset? we will reply to you within 12hours and provide the best solutions. --With 50mm high sensitive large speakers, surround sound and bass response, ensure clear vioce in video games & skype. If you can't hear any voice, please check whether the volume is too low, or whether to turn on the microphone. --280g lightweight, cool comfort and 3.7 inches large ear-wraped style memory ear earmuffs, no press ears, suitable for the gamers' different head shape for a long playtime! --Our gaming headset with mic supports Xbox 1 Xbox One S/X playstation 4, nintendo switch, Wii U, PC, computer, laptop, MAC, iPad, tablet, phone and more devices with stereo 3.5mm plug. --If you not sure, welcome to contact us. --Old Xbox One needs a adapter (no included). --This headset isn't compatible with Xbox 360 and PS3. 【Breathable & Comfort】Gaming headset owns a ultra-lightweight form factor, 3.7in large ear-wraped style memory earmuffs, cool comfort and no squeeze ears. Suits gamers with different head shape for a long playtime. 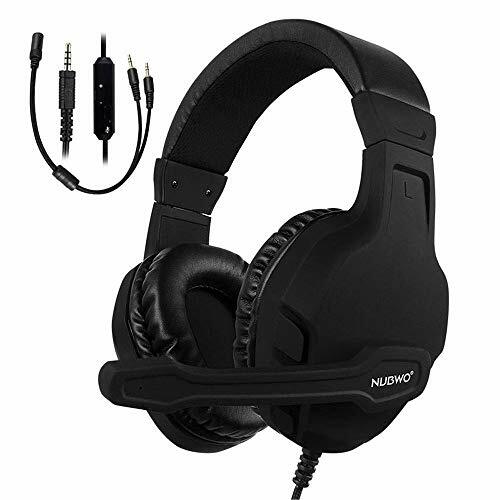 【Stereo Audio】Using 50mm high sensitive large speakers, NUBWO gaming headset enhances surround sound and bass response, deliver immersive sound for video games, music, movies, and more. 【Noise Cancelling Mic】Gaming headset with Omni-directional mic, noise cancelling for clear voice pick up, reduces the background noise, perfect for Xbox One, PS4, Nintendo switch, PC games, etc. 【Multi Devices Compatibility】 Suits 3.5mm port devices. The gaming headset is compatible with computer, PC, laptop, MAC, iPad, tablet, mobile phones, nintendo switch, Xbox 1 S/X, PS4. Plug and play. 【Easy Volume Control】Volume dial and mute switch are close at hand to quick adjust the audio. The 63 inches extra-long cable can be placed anywhere to make it faster and easier to control the gaming/chatting volume. If you have any questions about this product by NUBWO, contact us by completing and submitting the form below. If you are looking for a specif part number, please include it with your message.